Ok, ok that's enough of hitting the caps lock key for me. 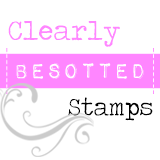 I'm actually popping by today to share a kinda fun blog thingy with ya. I'm actually being a blog gatecrasher! Yup, I've got full control of another blog - well, I s'pose it doesn't count as gatecrashing if you've been invited but I like to feel like a rebel sometimes y'know *wink* Jill Foster has trusted me with her blog - Inspired By - for a day whilst she has a blast at CHA. Right, I've really gotta try and get my brain around the next round of Gallery Idol - have you seen that it's to use fabric? You know me and my lack of seamstress skills don't ya? I'm gonna need all the help I can get! Have a super duper weekend! For those of you attending the PTI Stamp-a-faire have a blast for me and get seriously inked up - so wish I could be there! Congratulations to you Aimes! Your card was so dreamy and I'm sure you'll come up with something fantastic-o for this round! So excited for you girlie...your card is perfect for today...enjoy your day!!!!! WAHOO Aimes!!! 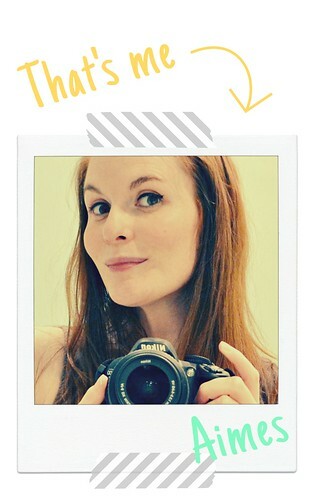 You rock girly and so does this bold awesome card! I love those flowers! The card for today is fabulous and WHOOO-HOOO on making the Top Ten! Congratulations on the Top 10 for GI - Can't wait to see what you do with Fabric. I discovered your blog through GI and love it. Pop by mine sometime if you get a chance, I'd love to have you visit. Oopsie...I forgot to mention that I love your card here and how you were inspired by Jill's fabulous card. Now I've discovered her blog through yours. This crafting world is Awesome! Yep, right up there where you should be! So well done though! Oh and love your take on Jill's card - great pop of red. Fab card by the way. Great job Aimes! 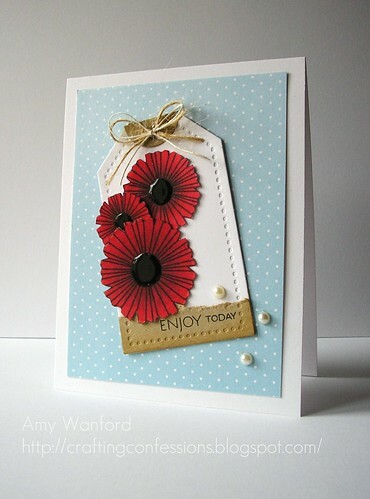 This card is so lovely with those dark red flowers!! Congrats on Top 10! Way to go! You are a particularly creative lady, and I am sure you will make something fab :O) I look forward to seeing (and voting) for it! Way to go, Aimes...You go girl! Your designs are fabulous, I'd be surprised if you WEREN'T picked! This card is gorgeous, that pop of red is simply AMAZING! GOOD LUCK to you on the next round...I'm sure you'll ace it! Yahoooooo!!! Taking a quick break in between make and takes! I will be sure to tell Nicole that she needs to schedule this a week later next year so that my Idol friend can make it next year!!! You SUPERSTAR!! Huge congrats - I really can't imagine what you're feeling right now but enjoy it sweetie (I'm sure I didn't need to tell you that!!). LOVE this card - you know me and Pure Poppy - can't get enough of it!! beautiful card inspired by Jill! Wow, Aimes, how exciting to have one of our PTI Peeps be an actual celebrity-know you are on cloud 9! Always LOVE your designs and this one is awesome as usual. Can't wait to see your entry for the next round! Congrats on making the top 10!!!! I love those bright red flowers, they just pop on that background! Neat layout too with the tag. And so many congrats on making top ten, can't wait to see what this upcoming week brings! This is just super-luscious gorgeous! Love those blooms on there - no surprise you've had a blog crashing invite!! And MAHOOSIVE congratulations on the top 10!! So, so thrilled for you Aimes!